Job opportunities come available every day and are quickly filled. Many individuals who experience various disabilities can perform these jobs through the use of assistive technology solutions. 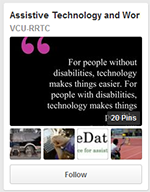 This webcast focuses on A.T. and employment and the methods, materials and resources for creating assistive technology solutions in minutes for employment using every day items and materials. Employers and potential employees need immediate solutions to achieve successful employment outcomes. Mar 10 - Experiences and Employment of Veterans with Amputations - Presenters: Amy Armstrong, Ph.D., C.R.C., Benjamin Darter, P.T. May 12 - Identifying What People with Physical Disabilities Want and Need to Know About Employment - Presenters: Matthew Bogenschutz, Ph.D., Katherine Inge, Ph.D., O.T.R. Jun 9 - Building Social Capital to Access Opportunities and Contribute to Our Communities: Two Self-Advocates Tell Their Stories - Presenter: George Tilson, Ed.D. 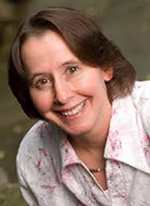 Aug 11 - Customized Employment as an Evidence-based Practice to Improve the Employment Outcomes of Transition-age Youth with Physical Disabilities - Presenters: Katherine Inge, Ph.D., O.T.R., Carolyn Graham, Ph.D. Multiple sclerosis (MS) affects approximately 2.3 million people worldwide, with most individuals being diagnosed between the ages of 20 and 40 during what are usually the most active employment years. Employment is of great importance to adult life and produces tangible (income, fringe benefits) and intangible (intrinsic benefits, purpose in life) benefits. However, MS can present significant barriers to maintaining employment. 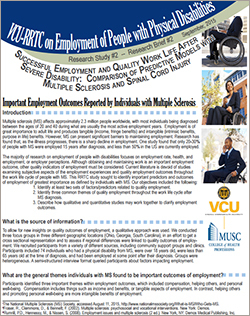 Research has found that, as the illness progresses, there is a sharp decline in employment One study found that only 20-30% of people with MS were employed 15 years after diagnosis, and less than 50% in the US are currently employed. Don't Miss This Archived Webcast! It's not too late to watch the The Opportunity Game: How to Present Yourself as an Ideal Job Candidate archive! In this webcast, George Tilson, Ed.D. provided job seekers with key strategies for identifying and securing jobs that are custom-fit to their aspirations, talents, and support needs. Finding that “right job” can be daunting for most of us, whether we have a disability or not; however, having a physical disability can certainly pose unique challenges. Dr. Tilson presented the “3 Ps” to successfully attaining and retaining employment: "Prepare, Promote, and Produce." Archived Webcasts - Did you miss one of our webcasts? Be sure to check out our 2015 Webcast Series.